The JBoss application server is widely used for building, deploying, and hosting highly-transactional Java applications and services. 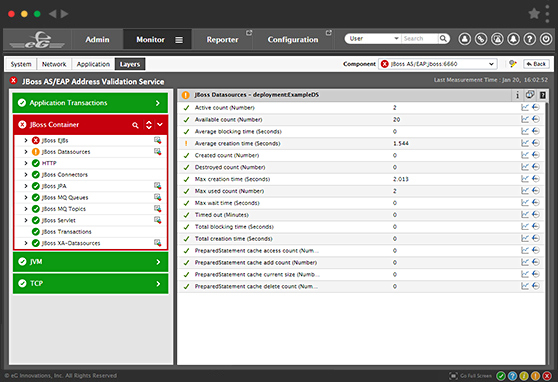 To ensure high application performance, it is essential to monitor the JBoss application server, the components it hosts and the infrastructure tiers supporting it. IT teams and developers need this capability in order to proactively detect performance problems before they impact end-users of the Java application. 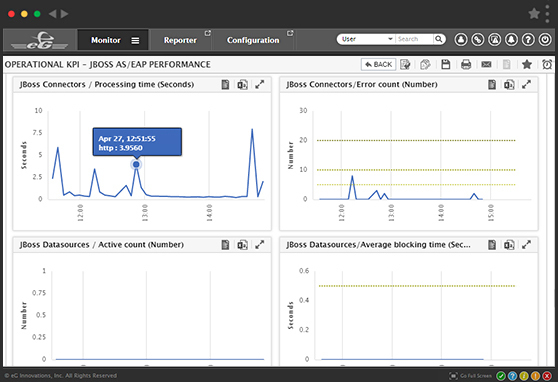 eG Enterprise provides a single-pane-of-glass view of the entire JBoss infrastructure. 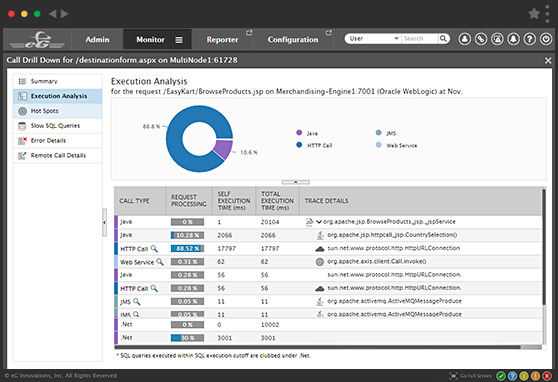 From an intuitive web console, application owners, developers and administrators can monitor the full Java stack including the JVM, web and EJB containers, application code, database connections, slow queries, external service calls, and more. 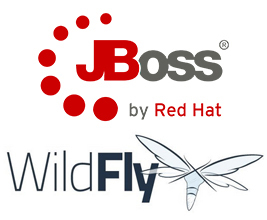 Out of the box, eG Enterprise provides purpose-built monitoring models for JBoss Enterprise Application Platform (EAP) and WildFly (formerly JBoss AS). Automatic correlation with server-side issues, resource deficiency (CPU, memory, disk, etc. ), and hardware faults differentiates application issues from the infrastructure. eG Enterprise allows developers to easily identify Java code-level issues. 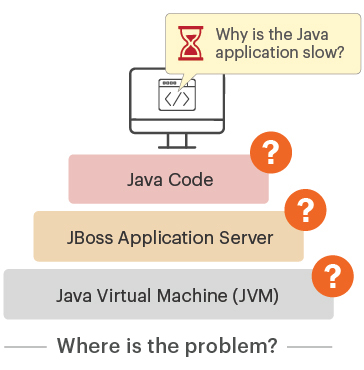 Which of the Java business transactions are slow or stalled? How many transactions are handled by each JBoss engine? Is the workload balanced across all the JBoss servers in the farm? Do you need more JBoss Servers to handle the load? Is a backlog accumulating on a particular JMS queue or topic? Are Java Servlets executing within acceptable processing thresholds? Are transactions waiting for connections from the DataSource connection pool? Is it sized optimally? User experience monitoring: Using real user monitoring and synthetic transaction monitoring, identify user experience issues and slow transactions. Find out if the issue is in the browser, network, or server. 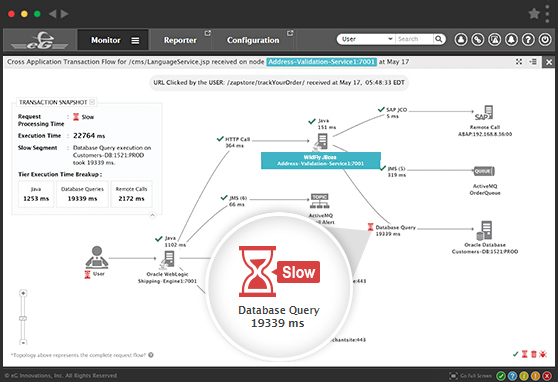 Business transaction tracing: Trace slow transactions across the Java application architecture and isolate server-side issues causing transaction slowdown. In-depth JVM monitoring: Comprehensively monitor every aspect of JVM performance including CPU, heap and non-heap memory, threads, classes, garbage collection, and more.